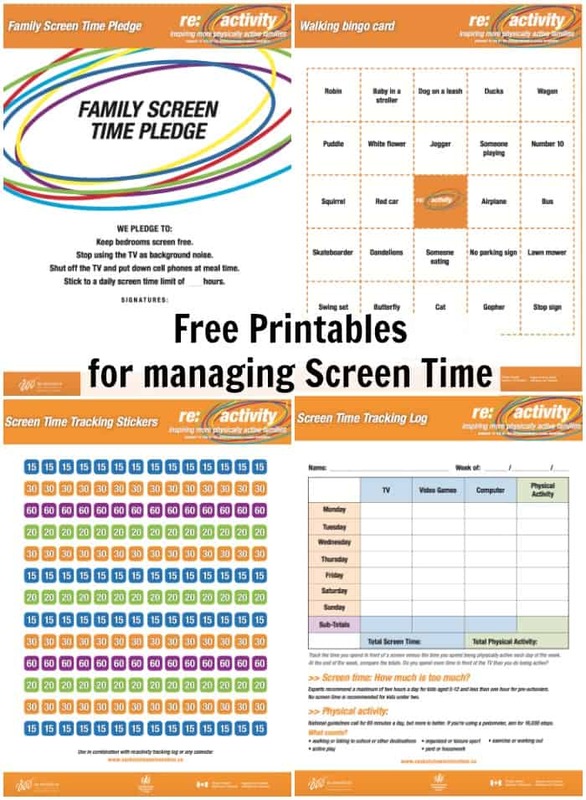 Screen-Free Week – Will You Accept The Challenge? Did you know that Canadian kids spend an average of 6-7 hours per day in front of a screen? Does that sound true for your family? When my son was a baby, I had strict rules about him not watching TV. As he got older (he’s turning 5 years old this week), those rules became a lot more relaxed but it’s time for me to make some changes. The one rule that I’ve always had is that the iPad is for special occasions only. For example, he’s allowed to play it on a flight, while waiting at the doctor’s office, etc. With limited time on the iPad, it keeps it as something special that still holds his attention when he needs to stay sitting. When it comes to television, this is where I need better rules! We’ve been in the habit of turning on the TV so he can watch it while he eats breakfast and it usually stays on until we leave the house. He isn’t always watching it (often it’s just background noise) but it is on longer than it needs to be. This past week, we did our own family Screen-Free Challenge and it was a lot easier than I expected it to be! For the entire week, my son wasn’t allowed to watch any television, movies, etc. The TV remained off for the entire week. I will admit that on Day 2, when I was busy trying to get work done, I was tempted to turn on the TV to keep him occupied for a little bit but I resisted that temptation. He did really well with playing with his toys, a lot of imaginary play, time outside exploring and helping me with chores. Although he still asked to watch TV a few times, he didn’t seem bothered that he wasn’t allowed to watch it. I think it was more of a routine thing for him (watching TV with breakfast) that he missed. Now that we know how easy it is to keep the TV off, we’ll be setting screen-free times at home and sticking to it. I loved hearing his imaginary play with his toys and I know he had a lot of fun playing and helping me with chores. You’ll find more tips plus checklists, apps for managing screen time and more on the Saskatchewan in motion website. Are your kids not excited by this challenge? Here are some fun ways to motivate them to participate! You’ll also find some great suggestions on the Mom2Mom podcast! Try a game or two from Saskatchewan Blue Cross’s Push2Play app – I really love the list of 100 games from childhood! Have you tried geocaching? Now would be a good time to learn more about it! Do you have old board games collecting dust? Set up a family board game night with a healthy snack buffet. Declutter the house and get ready to host a garage sale – we spent a lot of our time this week working on this project! Spend some time in the kitchen baking or teaching your kids basic cooking skills. Tackle a fun craft project as a family like building a birdhouse. Another chance to win: During Screen-Free Week, visit the Saskatchewan in motion Facebook page and post a #ScreenFreeSelfie to their Facebook wall. This giveaway is open to Saskatchewan residents only who are at least 18 years of age. Giveaways are void where prohibited by law. Winner will be chosen randomly. Winning entries will be verified prior to contacting the winner. The giveaway ends May 8th, 2016 at 11:59pm. A winner will be drawn randomly within 24 hours of the end of the giveaway. The winner will be notified, by email, and will have 48 hours to claim the prize & answer a skill testing question. If I do not receive a response from the winner within 48 hours, a prize forfeit will be assumed and a new winner will be chosen randomly. I reserve the right to disqualify any entries. I reserve the right to end, extend, or change a giveaway for any reason and without prior notice. By entering giveaways, you verify that you understand and meet the prize eligibility requirements. Please note that Moms & Munchkins is not responsible for sponsors that do not fulfill their prize. I will not be responsible for lost or damaged items. Replacement items will not be provided. We have represented each sponsor with the expectation that they will fulfill their prize in a timely manner. While we are not responsible, we will make every effort to assist the winner in obtaining their prize. Please wait 4 weeks for fulfillment of prize. Winners have 8 weeks to report non-fulfillment of prizes. Once the winner claims the prize, his/her name will be posted on the giveaway page. Your name, full mailing address and email address will be sent to the prize sponsor so they can contact you to award your prize. Great post, Cheryl! I love that you’ve set some new screen time rules going forward. Thank you, Kim! It’s easy to turn the screens off in the summer with such beautiful weather!